The gold pen blocks the light as well as black ink. 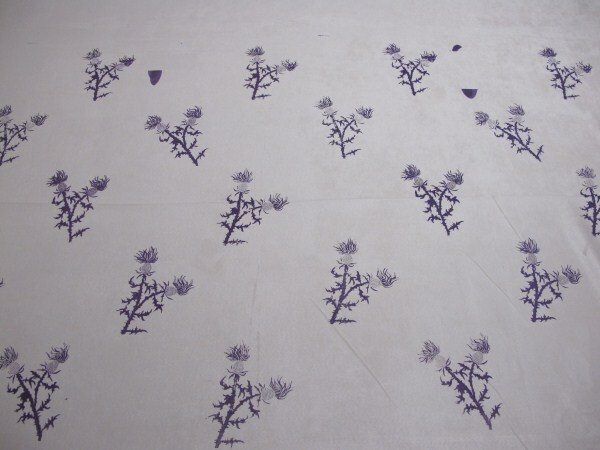 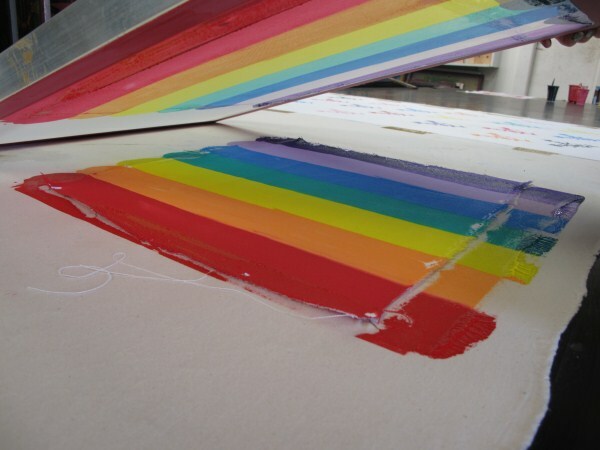 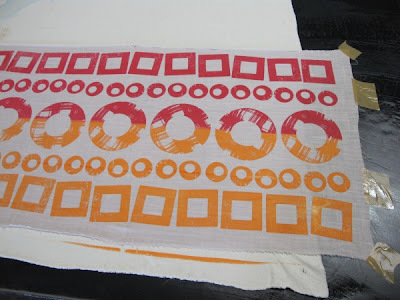 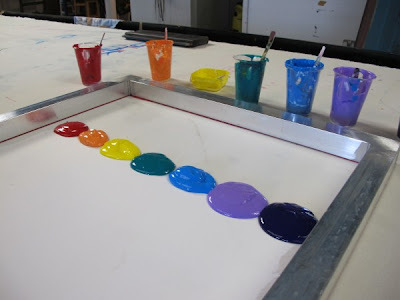 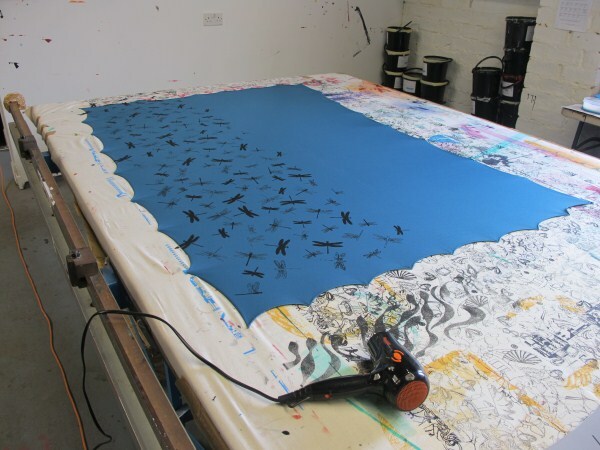 Instead of having to use pieces of cut out paper, this type of screen allows you to repeat the pattern so you can print larger pieces of fabric. 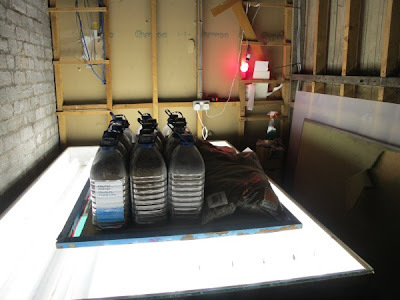 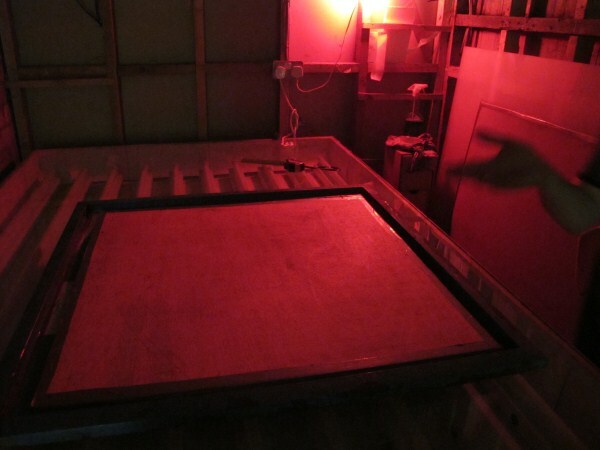 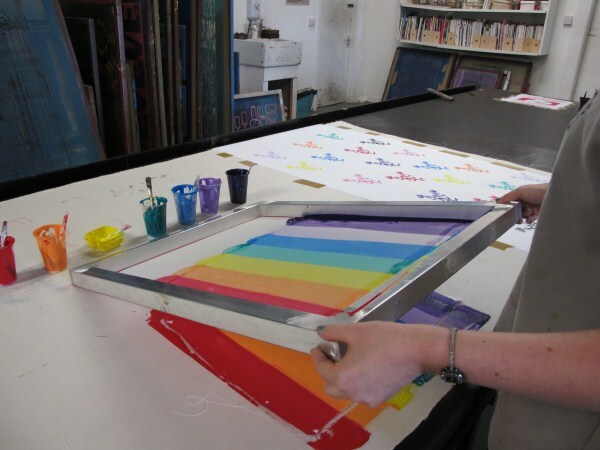 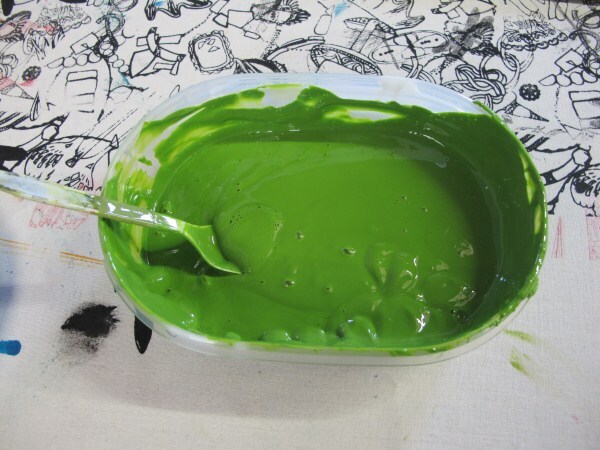 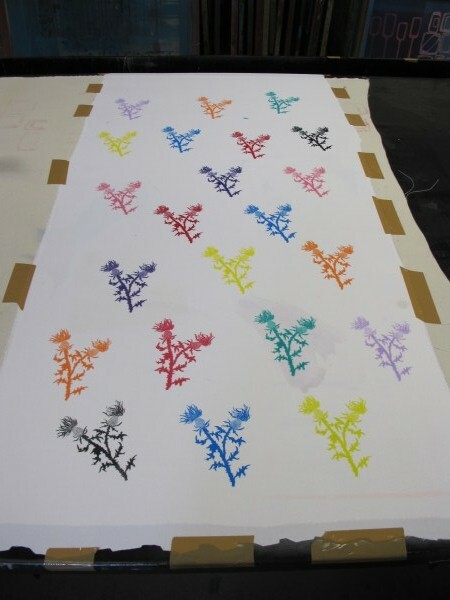 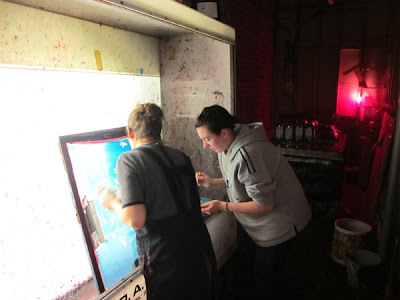 The way the screens are made involves using a light-sensitive turquoise emulsion on the screen which is activated by placing the trace on top and submitting it to light to set the emulsion around the drawn details. 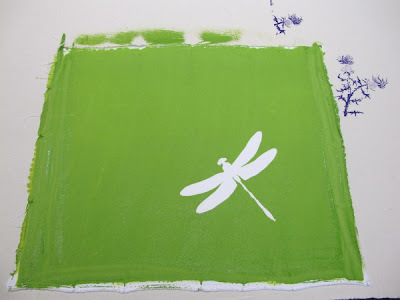 The details are then washed away allowing for the ink to be pushed through when printing. 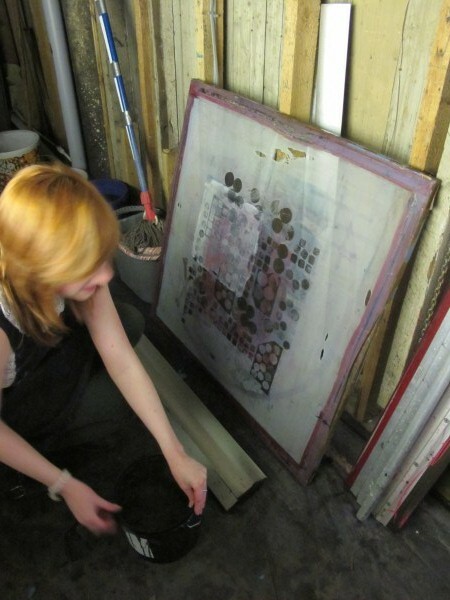 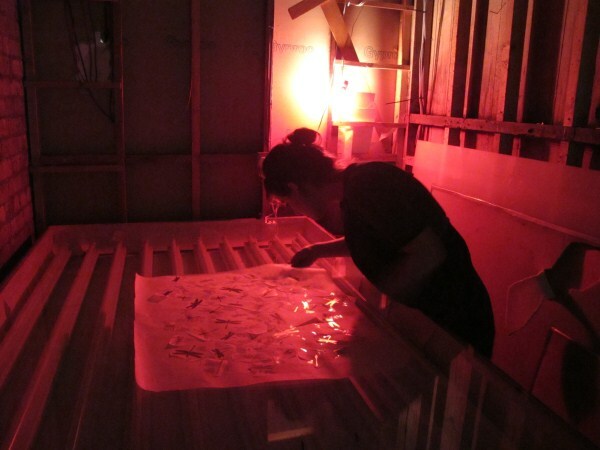 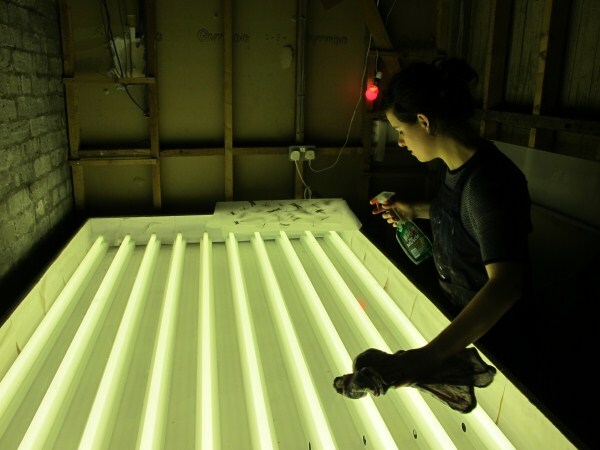 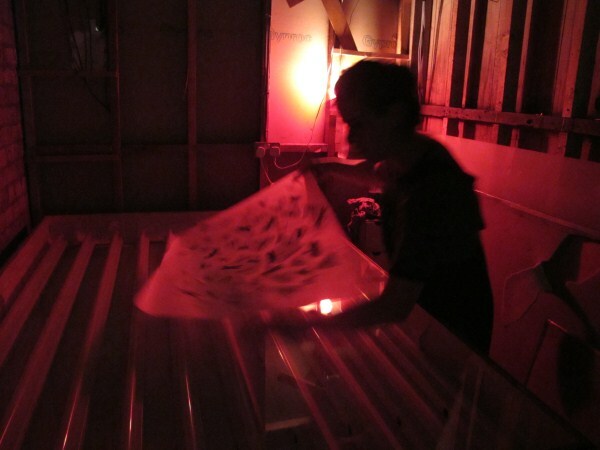 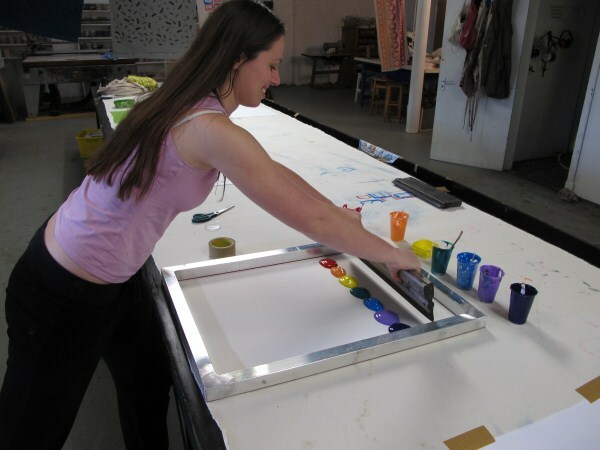 Yvonne applying the emulsion on to a screen. Roz and I took our traces home to finish them after the first day as it was taking a lot longer than we thought. 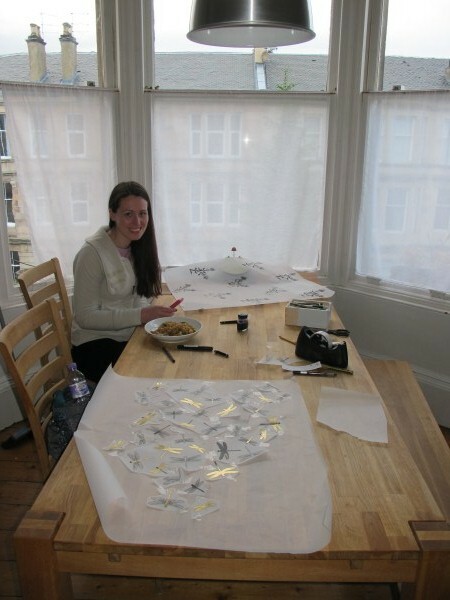 She eventually left at 9pm (we did stop for a quick microwave dinner) and I finally finished mine at 11pm! We wanted to make sure they were perfect since we would be using the same pattern over and over. I spent a lot of time making sure the edges would fit together like a jigsaw so I could match them up easily and there wouldn't be an obvious join in the pattern. Unfortunately mine didn't quite work as there were thicker parts of emulsion and the detail that was supposed to wash away didn't come off. 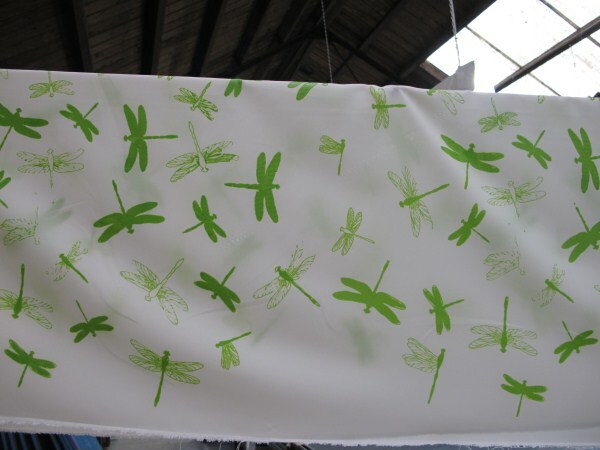 Marion had to turn the power hose up to wash it off but then too much came off meaning a few of the dragonflies were ruined. 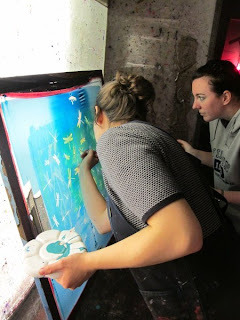 It wasn't a total loss though as we were able to touch up those areas with the emulsion to fix them but it was very difficult to keep the detail using a paintbrush. 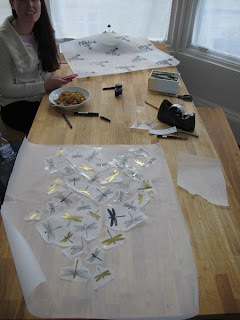 Luckily they turned out not too bad with Marion's help (unfortunately I am a perfectionist!) 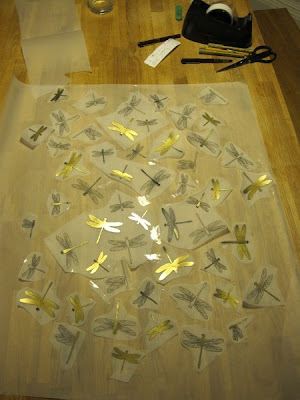 and I'm sure no-one but me would notice the defective ones. 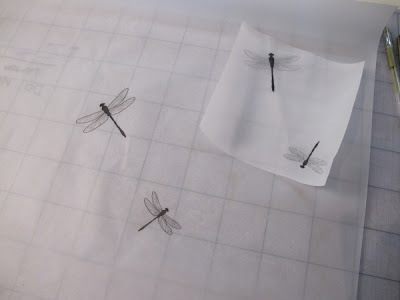 I was just disappointed that it wasn't perfect after having spent 10 hours drawing the day before. The biggest problem, however, was the extra time it took to fill in the defects which I had to do twice because it all washed off the first time I rinsed the ink off so I didn't have much time to get printing done. I did manage to get two scarves printed though, I just had been hoping to get more fabric printed since we had two days and spent a lot more on this course. My very own Olive Dragonfly scarf! 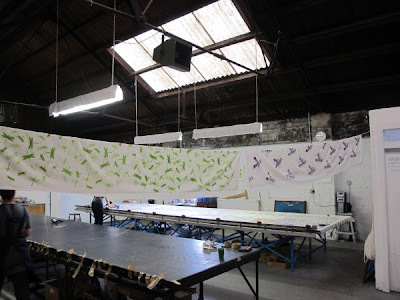 Mine and Roz's scarves hanging to dry. We didn't anticipate how long it would take to draw and get our screens ready but we had chosen very intricate designs after being told how detailed we could make them. I am really pleased with the results though - I just need to finish the edges before I wear them! 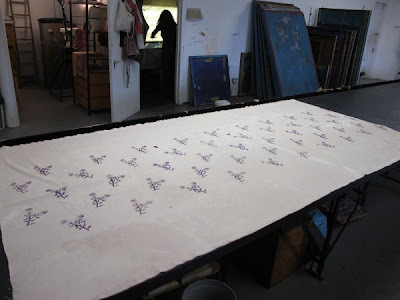 Roz also had a problem when using her screen as it had a few holes in it (not usually a problem as it can be taped over to stop the ink getting through and they'd managed to avoid it being where her pattern was). She also made a scarf which turned out well but unfortunately when she got to the middle of the large piece of £40 fabric she planned to make into a bedspread, the ink did get through and left a big smudge of ink right in the middle of her faux suede. 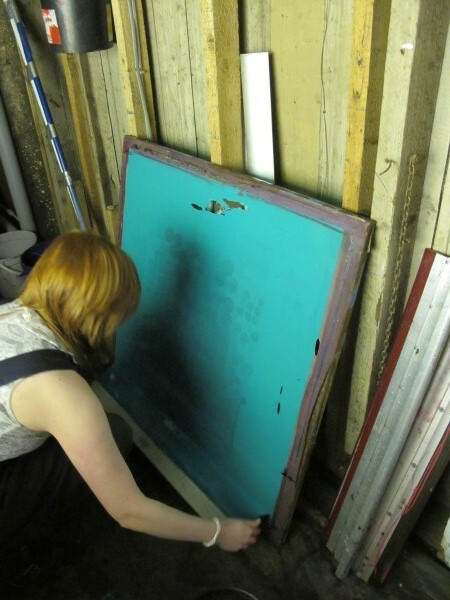 She re-taped it and moved on thinking one mark wouldn't be too disastrous (I would have been in tears after all that hard work!) but it happened again in two places!! She managed to carry on after rinsing and re-taping her screen and finished the bedspread anyway and a matching cushion. The day they offered us was a full 9:30-18:30 which would give us loads of time to print plenty of fabric! 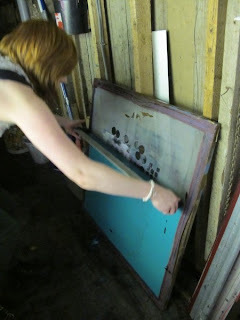 Cue another trip to Mandors! I decided I would really like to make an actual olive dragonfly dress and managed to find some cream fabric in the sale for £1.99/m and have decided to attempt to make it myself with a pattern I got there too! 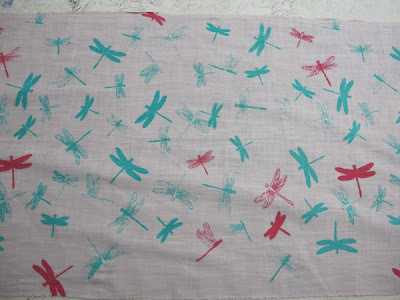 I had a piece of jersey fabric and some grey fabric I planned to make into a scarf and a cushion and also some stretchy teal fabric I thought would make a nice maxi skirt. 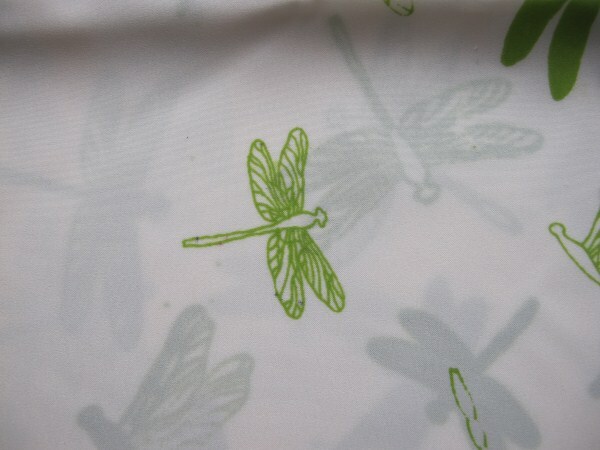 I managed to print all of it, a piece of green satin for another scarf and a little of our left over poly twill (which we used on the first workshop) to make an apron! 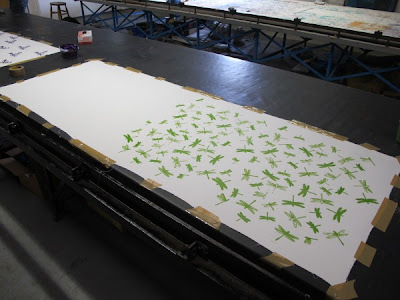 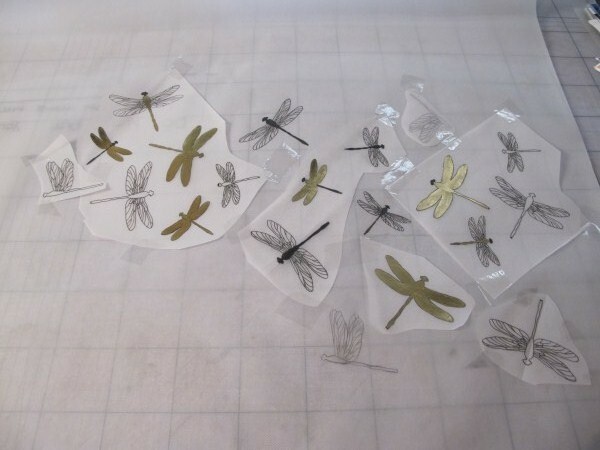 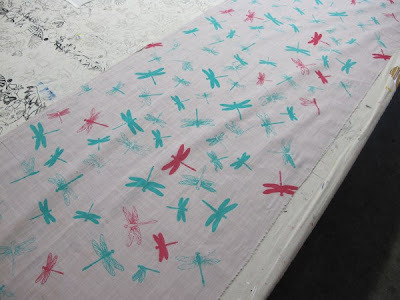 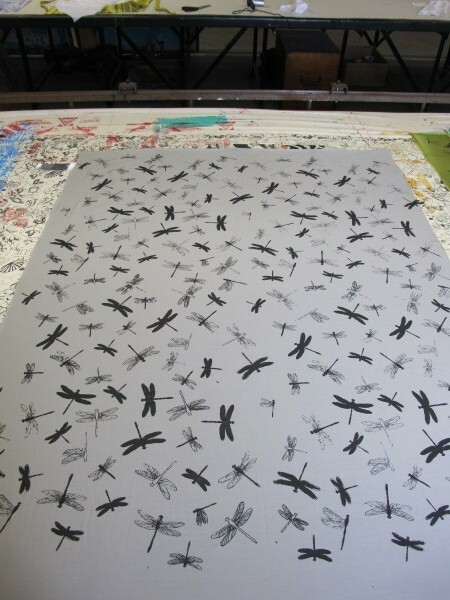 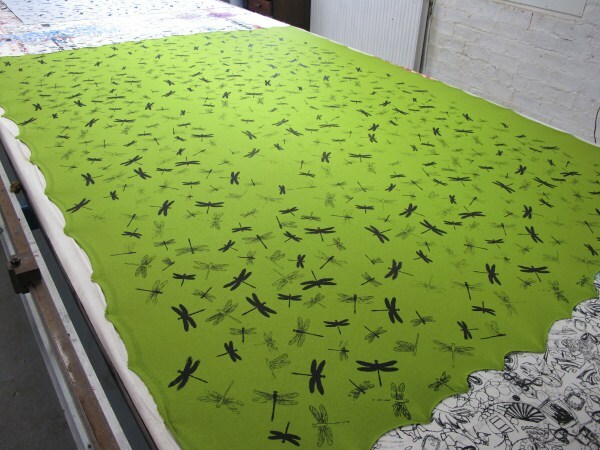 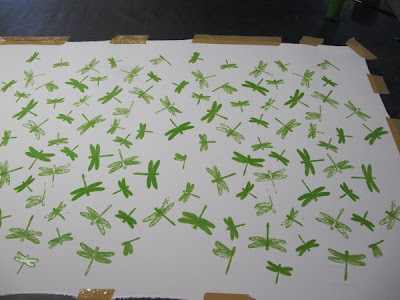 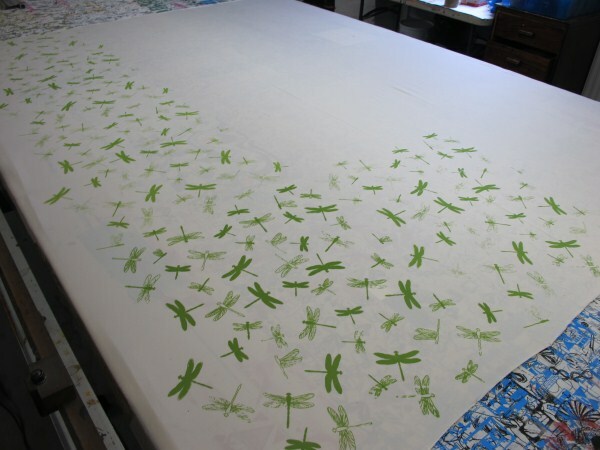 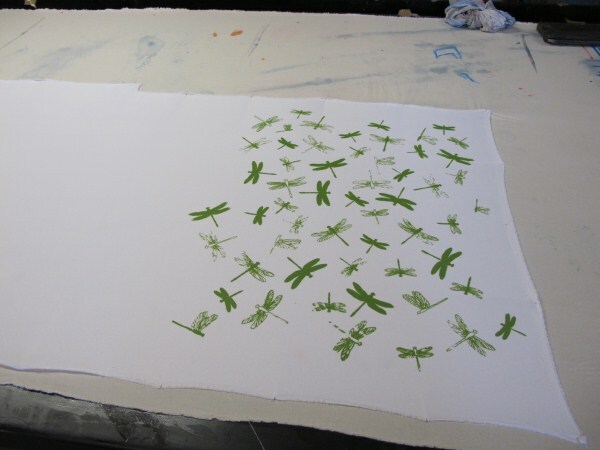 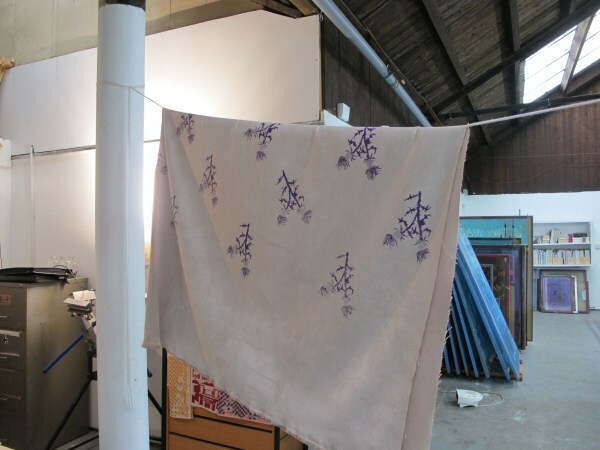 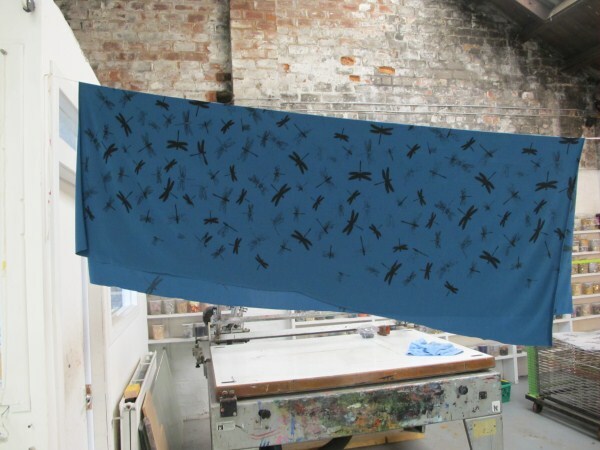 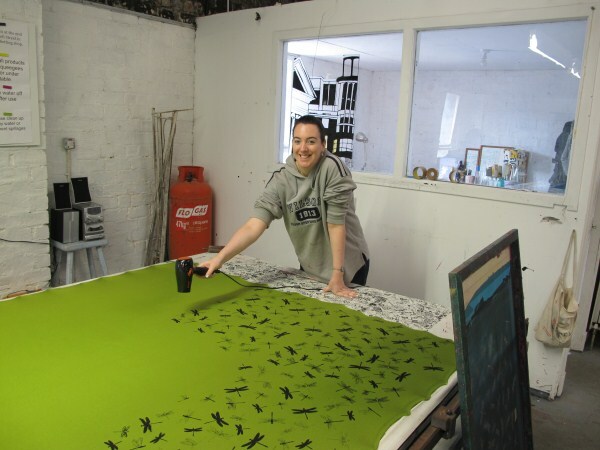 As we had the whole studio to ourselves, I pinned out all three pieces of fabric I was planning on printing black dragonflies on to so I could do one after the other with minimal washing and drying time in between prints. It was great to be able to spread out and Roz brought her iPod so we had some tunes. 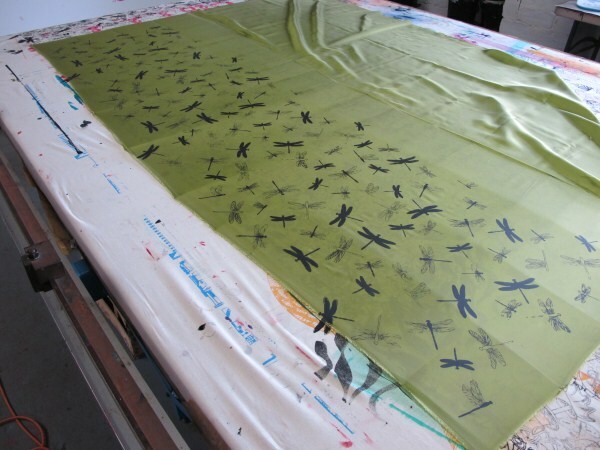 Luckily they had let me keep the olive green I'd made up before so I managed to mix up some more to match. And the piece I plan to make into a dress! 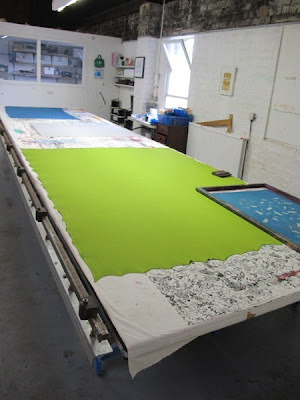 Roz managed to print a strip of the same fabric as her bedspread so we can cut out the centre (ruined) panel and replace it with the new piece and sew it all together as 3 panels. 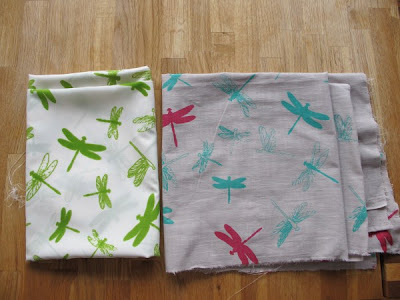 She also made an apron with all different coloured thistles and a rainbow stripe effect for the pocket and she used two of the girls' other screens (with permission) to make 2 different scarves. 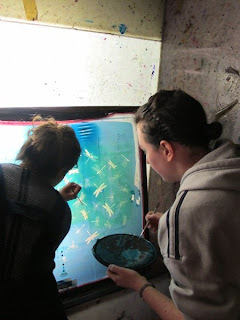 I would definitely recommend the courses with the girls, especially now they have ironed out the potential issues with holes in screens and the like. They also plan to make it clearer that the first day is for making the trace and the 2nd day for printing. 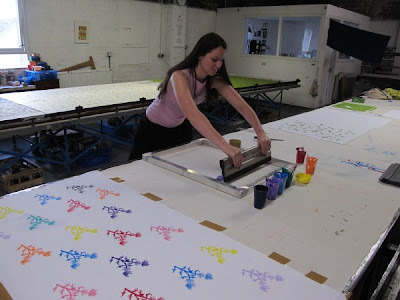 If you are organised and know what you want to print though, there's nothing to stop you drawing your trace in advance to save time for printing on the weekend as one girl in our group did. Great work, it looks brilliant. 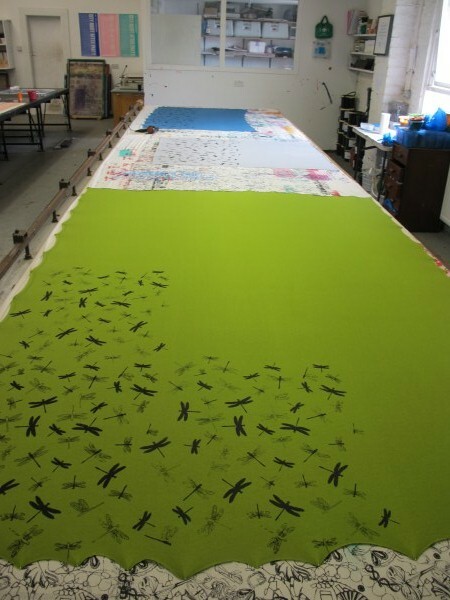 Wow - it looks like you did some great things!